Bubbling away in cast iron pots over an outdoor hardwood fire, the multi-cultural dishes of gumbo and jambalaya were an affordable and satisfying way to nourish a gathering of neighbors, congregations, and hunters. The addition of a base of roux has fueled a heated gumbo debate over the centuries. How much roux to add can mean the difference or preference for that matter between a “juicy gumbo” or a gumbo the consistency of a thick and rich gravy. The color of the roux is as personal as the time honored wooden gumbo spoon used to stir it. Ranging from the color of a paper bag to the deepest, darkest chocolate, the length of time used to brown the roux sets one recipe apart from another. 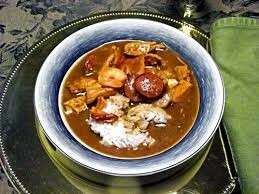 Gumbo had its debut on the menu in 1803 at a Louisiana Purchase gala in honor of the governor William C. C. Claiborne. Today, New Iberia, Louisiana boasts the World Championship Gumbo cook-off the second weekend in October. There, contestants battle it out over simmering pots of secret family recipes and spice blends as varied as the region. The origins of Jambalaya are not as clear as gumbo; much like its recipes, jambalaya’s history is varied. Most commonly held is the belief that the Spanish brought the dish to New Orleans in an effort to replicate their national dish, paella. But unlike in Spain, where saffron is an integral ingredient, tomatoes were used as a substitute for the unavailable spice. Jambalaya is unique to many of the local dishes of the time because the rice is incorporated in the cooking process. 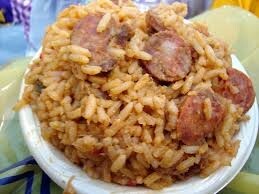 There are many legends of where the word Jambalaya originated. The most widely held is the combination of the French word for ham, jambon, the French word for in the style of, a lá, and the West African word for rice, ya. Another favorite is the French word for mish-mash, jambalaia. New Orleans is home to the Creole variety of jambalaya, which uses the tomato as the base. The” holy trinity” (onions, peppers and celery) is sautéed with the meat and then a flavorful stock, tomatoes, and rice are added and simmered until the stock is absorbed. The rice finishes with a red tint, which is why it is sometimes referred to as “red jambalaya”. Creole jambalaya would have used proteins found near the city such as chicken, sausage, and seafood typically. As French Cajuns spread out to the neighboring regions of Louisiana, they adapted the Cajun jambalaya to the tastes and ingredients of their surroundings. Cajun jambalaya begins with meats such as wild turkey, venison, alligator, sausage, crawfish, duck, or squirrel cooked in its own fat until it caramelizes, the “holy trinity” is added along with stock and rice and cooked until the rice has absorbed all of the stock. It is characterized with a brown color from the meat. In 1878 the Gulf City Cook Book, published by the Ladies of the Saint Francis Street Methodist Episcopal Church, featured the first know recipe for jambalaya. In 1968 Louisiana governor John J. McKeithan proclaimed Gonzalas, Louisiana Jambalaya Capitol of the World. Gonzalas hosts a festival in this honor every spring. Variety is truly the spice of life. You haven’t lived until you tuck-in to a bowl of dark chocolate, blue crab gumbo served over a crab-fat potato salad. Or stood over a cast iron backyard jambalaya pot savoring bacon, chicken, sausage and pork sizzling, awaiting a healthy heap of the “holy trinity” and rice. It’s the flavor of the South born right here in Louisiana.